One of the greatest things about video games is that they can be used to try out experimental methods of storytelling. A good example is The Binding of Isaac, which slowly reveals what the game is actually about through its many endings. Iris.Fall attempts to use the medium of video games to tell a story through complex imagery and bizarre visuals yet falls short. 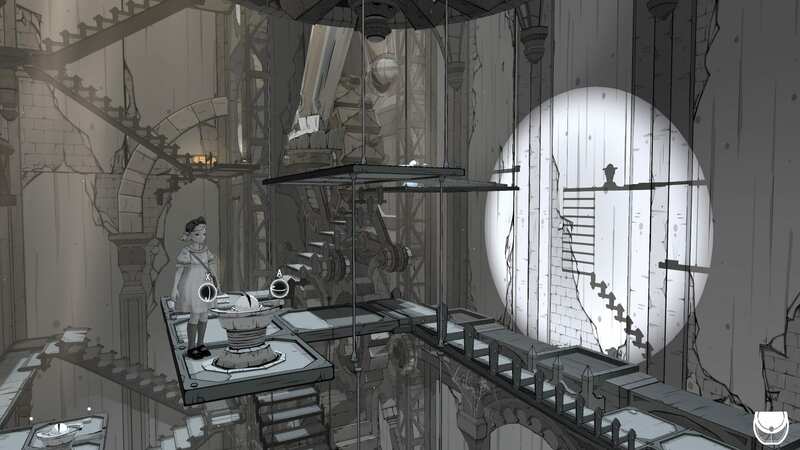 Iris.Fall is a 3D puzzle-adventure game for Steam and Xbox One. You take control of Iris, a small girl who, after waking up from a nightmare, chases after a cat into a mysterious, dilapidated theater. 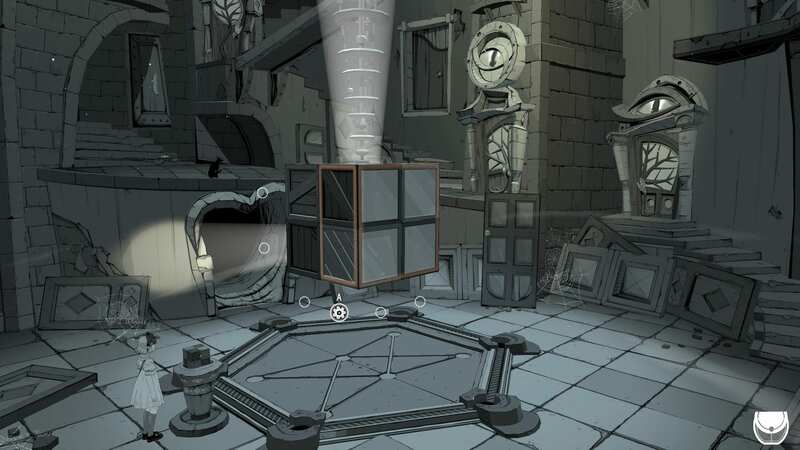 The game’s main gimmick is interactions between shadow and light, with the ability to sometimes enter the shadows on the flat surface of a 3D room. 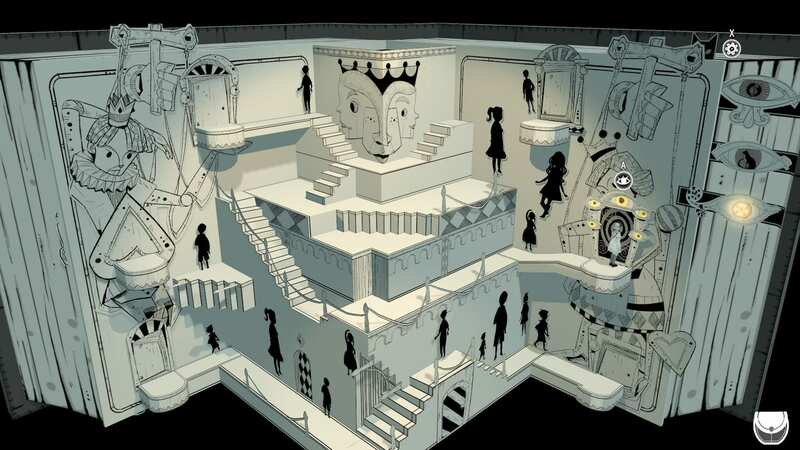 One of the game’s earliest puzzles has you flipping around a staircase in order to reach a higher floor. I like the large variety of puzzles in Iris.Fall. The main theme behind all them is that of positioning. For example, there is one where you raise and lower pieces of a bridge from within the shadows so you can make it to the other side. Another has you placing butterflies of different sizes on hooks so their shadows perfectly fit into the outlines on a wall. Some of the shadow puzzles get very creative and require you to think a little outside the box, such as moving a light source around to create a shadow from a platform that is above you in order to reach that platform. One of my favorite group of challenges involved 2×2 Rubik’s Cubes that had light beams you needed to line up with doors in the background. While I really liked the vast majority of the puzzles in the game, I was a little irritated when I noticed that the game used some of them only once. At the beginning of the game, there is a small group of circuit riddles where you need to use wires to connect two ends of a circuit. I really liked these and I hoped they would come back later, perhaps to turn on a light source, but they never did. The same goes for the 2×2 Rubik’s Cubes and to many other types of challenges in the game. The game rarely builds upon previous puzzles and chooses to focus more on quantity over quality when it comes to their types. It was a little disheartening to see that the game never mixed between two different styles of riddles. Their overall quality was still fairly high and some were actually difficult to solve; the issue here is that the game introduces a riddle type and never fully explores what it can do with it and how it may interact with the other types. The game never tells you what you need to do, but through its visual design it’s very easy to figure out. While I was let down by this lack of depth in the puzzles, the game’s atmosphere never disappointed me. The game does an amazing job at creating a wonderfully eerie setting, and this was the best aspect about it. With its gray monochrome art (and the occasional orange and blue), creepy, fantastical visuals, well-animated 2D cutscenes and music box and accordion-filled soundtrack, it fully engrossed me into its world. I only wish I could praise the story as much as I do the individual puzzles and atmosphere. I commend Iris.Fall‘s attempt to tell its story through only visuals, with absolutely no dialogue or text at any point. Yet, by its end, I was completely confused as the storytelling itself is unnecessarily incoherent. Most of the clues as to what’s happening are gathered from the twisted visuals and cutscenes. However, the story is told very anachronistically and many elements appear only once with no follow-through. I would honestly be surprised if someone could understand what the story was after playing once or even twice. It’s difficult to figure out what you are supposed to take literally and what is supposed to be interpreted figuratively. The visuals themselves are a little too outlandish at times that it’s unclear what you are supposed to interpret from them. The book section of the game acts as a microcosm, both visually stunning and utterly confusing. The game does have a few visual leitmotifs with its focus on eyes and puppets, but again, it’s not clear what they are supposed to signify. By the end, I still could not figure out how much of the game actually happened, who the cat you see throughout the game is, and why there is such a strong focus on shadows. Perhaps the game’s narrative was too complex to be told through visuals alone, or maybe the visual metaphors were also too vague and the game could have made them a little clearer. While I don’t want the game to add text to explain everything, I feel like better context for the visuals could help a lot. My biggest issue with the game is that it’s too short. I managed to get all of the achievements in four hours. I believe that it’s a good game to introduce players to the puzzle genre as most of the challenges are fairly basic. I also think that anyone who wants to learn how to craft strong visual design has a lot to learn from this game. The best way to describe it is that it’s a brain-teaser, for better and for worst. Ofir reviewed Iris.Fall on PC using a code provided by the developer.